Market conditions in New Zealand continue to show steady growth, A trend which has been evident for the past three years. Local contractors are busy as Christchurch remains the focus of on-going re-construction work in commercial and civil works. Recognising that the market is getting stronger, the Hire Industry Association of New Zealand recently staged their annual conference with delegates descending upon the beautiful location of Wairaki Resort, Taupo. Youngman Richardson & Co, the authorised NZ distributor for Genie was the principal sponsor of HIANZ. 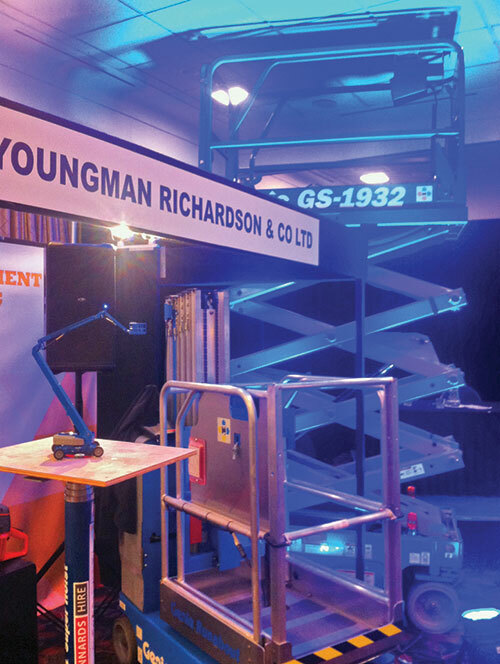 At the conference, Youngman Richardson & Co was well represented with range of Genie® lifts which included a GS™- 1932 scissor, TZ™-34 trailer mounted boom and a GH™-5.6 Super Hoist™. While the conference presents a unique opportunity to meet up with Genie friends, the Wairaki resort also provided the perfect setting to network over golf and other associated activities. A highlight of the conference was the street party theme night which featured a magician and carnival entertainment. Genie recognises and appreciates the excellent work undertaken by Youngman Richardson & Co in presenting the Genie products to the NZ rental companies.